At the end of part one, you should have had a fully painted mask. Be sure to weather it as needed. After your mask is painted, time to make the dreads. I used backer rods (found at Home Depot or Lowes). The largest size my store had was 5/8" so that's what I used. 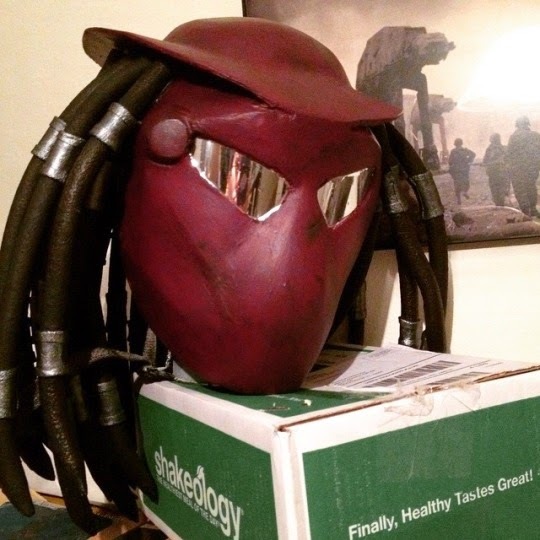 It's a little smaller than most masks, but I'm doing a fem predator, so I thought it would work. Backer rods come as one long tube. Therefore, you need to cut it to size. I put my mask on and held the rod to the mask and marked. Then used that one to measure the rest. Cut out a bunch. I ended up needing 3 packages of backer rods to have enough dreads. Once cut, melt one end. I used my heat gun. You can also use a flame. Take this step slowly, because they melt pretty quickly. Next, you want to add beads. I decided on 2 per dread and I used worbla. Basically, I cut a long thin strip of worbla, heated it and bent the sides in, then heated it again and wrapped it around the dread, snipping with scissors. Ignore the painting on the dreads in the pics. Found out the hard way that I really didn't need to paint it before the beads. After you have your beads on, give your dreads a couple coats of black plastidip, followed by black spray paint (if needed). Then, carefully, paint your beads. I did a metallic finish, therefore they had to be base painted black (which is why you don't need to paint the dreads first). This was about half of the dreads I needed (actually slightly less than half). Once your dreads are ready, you can hot glue them to your mask. I did mine in two layers, alternating heights. You could also heat the dreads and bend the top so that you can glue just the circled end to your mask, but be very careful not to melt them or bubble your paint. Repeat on other side. Typically, screening is inserted into the eyes. But I had some mirror tint available so I used that. This biohelmet ended up being WAY too hot, so I am currently working on a new one. I'm sculpting it out of clay, then making a mold, then casting it. Be on the look out for a tutorial for that!